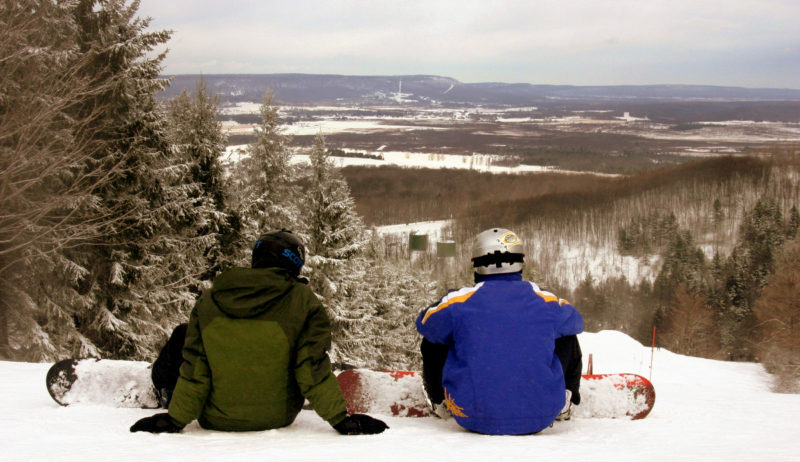 Snowboarders overlook the lofty Canaan Valley from Canaan Valley Resort. Photo courtesy Canaan Valley Resort. Is it too soon to talk about skiing? — not in the highest peaks in the Appalachian Mountains, in which snow is expected in less than a month. Flakes will fall west of Washington, D.C., by the end of October; and Canaan Valley Resort will be waiting. 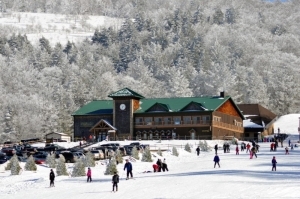 One of three ski areas in what’s been acclaimed as the highest upland valley in the eastern U.S, the resort is preparing for an influx of new skiers from Washington who are discovering the US-48 expressway, which has shortened drive-time from the valley to the capital to two-hours-and-forty-minutes. 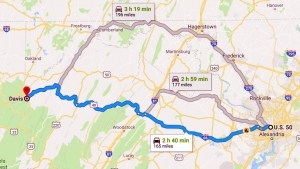 Google Map showing directions from the Canaan Valley area at Davis to Washington, D.C., now a drive of 2 hours, 40 minutes. Targeted to open Dec. 15, staffers are already preparing for a robust season, according to general manager Steve Drumheller. “Our crews put in a tremendous effort to make our ski area the pride of the valley,” he said, referring to the many winter amenities for which the valley is renowned, including nearby Timberline ski area and Whitegrass cross-country ski area. Canaan has doubled its snow-making capacity in recent years and has added new ski- and snowboard-rental equipment as well as ice skates and cross-country skis. A new “out-of-bounds” cross-country ski trail has also opened on the back side of the ski hill. The ski area has swept Liftopia’s “Best in Snow” awards in the Southeast U.S. the past two years. Canaan operates the top-ranked ski area in the Beginner-Friendly, Most-Challenging, Family-Friendly, Best Snow Quality, Least Crowded, and Best Value categories. Its ski school offers group and private ski and snowboard lessons as well as telemark and cross-country lessons. Children’s programs include Canaan Cub Club for children ages five-to-eight and Mountain Adventure for ages nine-to-12. Season passes are now online: a single season pass is priced at $440 if purchased before Sept. 30, 2018, and $497 if purchased between Oct. 1 and Nov. 30. After that, the season pass reaches the full rate of $550. Children, college students, seniors and West Virginia residents will find additional savings. Skiers cavort at Canaan Valley Resort. The ski area boasts a summit elevation of 4,280 feet above sea level, and boasts 91 skiable acres accessible by four lifts — a quad, two triples, and a magic carpet. The resort operates year-round and includes an 18-hole championship golf course and a lodge and cabins and a campground with access to indoor and outdoor pools.